Before I picked up the Nolan N104 last week, I didn't do any research on the compatibility with the Sena SMH10 Bluetooth unit. Apparantly, the N104 is one of the few helmets where you can't simply clamp the unit to the side of the helmet due to a plastic trim piece which is a wire channel for their own N-Com communications unit. Fortunately, Google to the rescue. 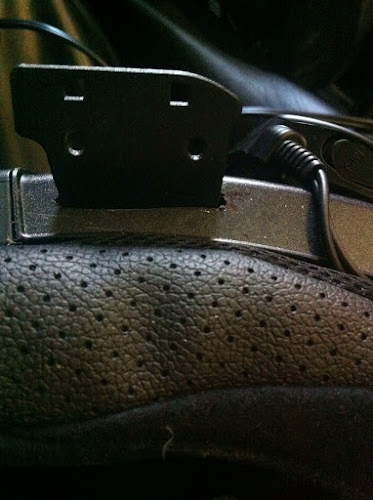 On an FJR forum, there was a post showing how they used a Dremel to cut a slot in the plastic trim piece for the bracket to slide into. It seemed like a simple fix so I did the same. After a little bit of measuring, I cut a small slot in the trim piece until the backet was snug. 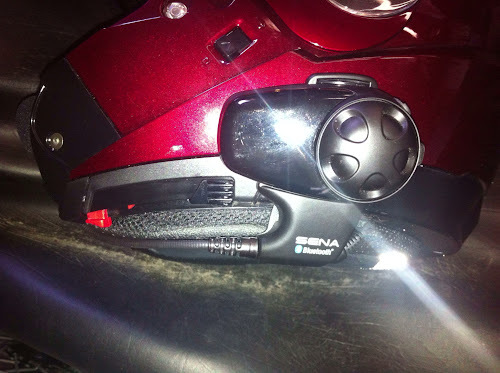 After a bit of cleanup with a sharp knife I now had a non-returnable helmet but a nice slot for the Sena bracket. Total time for the mod, 2 minutes. After I get everything fitted, I'll add some black silicone caulk to seal the slot to keep the wind noise down. The Sena speakers fit the stock cutouts perfectly and are a nice snug fit that doesn't need any additional double stick tape to stay in place. The wire for the right speaker is routed within the channel provided by the plastic trim piece. The liner pieces and neck roll are then put back in place. The base for the electronics module is then simply clamped in place using the supplied allen head screws and the excess wiring for the speakers routed into the plastic channel. The position of the unit is further back than is optimum but it's necessary to clear the internal sunshade control which is directly in front of the Sena bracket. I think the microphone boom clears the bracket enough to reach the controls. The positioning of the unit has the microphone on one side instead of directly in front. I'll see how this works later. I also ordered another Sena unit for my wife's new helmet and Amazon claims that it'll be here on Monday. Yesterday, turned out to be a university staff holiday. I guess we get a day off for spring break. I took the rig out for a ride partly to get familiar with the handling again as it has been a while since I've been able to drive it. It was -9°F when I left in the morning and I just sort of drove around the area for 1½ hours stopping once to refill the tank. I had added some gas from a gas can when I added the Heet to the tank a few weeks back. The Heet seems to have solved the rough running for now. Maybe there was moisture in the tank. No issues at all on the ride yesterday though I did bring the portable battery jump unit with me just in case. It was a beautiful, sunny day and I tried to stop and take some pictures during the ride but my iPhone had shut itself down possibly due to the temperatures. I guess next time I should carry the phone on my person instead of just throwing it in the tank bag. The engine ran just fine and I put on about 60 miles. By the time I returned home, it had warmed up to a much more "Spring-like" 6°F. The only handling issue I need to look into is the rig pulls to the right at 50 mph and I think this means I need to increase the lean out a little. The new Nolan is much quieter than my old HJC Symax-II and with the Pinlock visor, no more fogging up! For me, this is a big deal as I would have to ride with my visor partly open from about mid-September on due to fogging. I still needed to open the visor if I was stopped at a long red light as my glasses would start to fog. Not a problem if I'm moving. 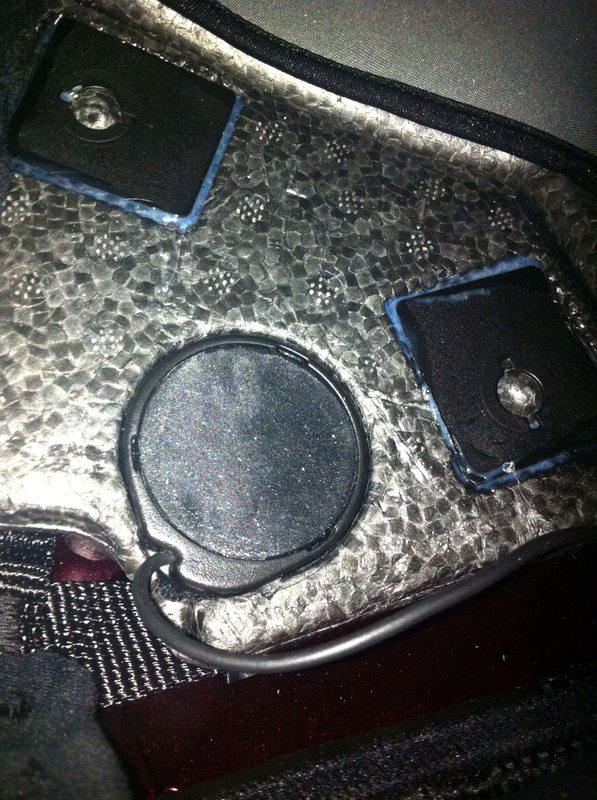 The availability of the Pinlock visor alone was a good reason to upgrade but the reduced noise level is pronounced. I may not even have to bother with earplugs anymore. Looks like a very nice installation. So far, I've not had any sound in my helmets, though I have considered it. Maybe I'll try it in my next one. I've never had any sound in my helmet either. The opportunity arose at the end of last year to split a two pack of the Sena units with Bobskoot. In my HJC helmet, there was no room for the microphone as the chin bar was touching my chin so I never even tried it out. My new HJC helmet is sitting there with the Sena just waiting for Summer. All labels are still attached. 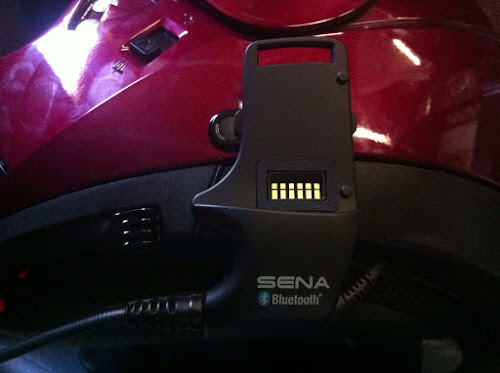 I am moving ever closer to getting a Sena unit. Last year when I was out with hubby, he blasted along and didn't noticed wasn't behind him. This was when Scarlet was being finicky and needed the CDI. So there I was on the side of the road for 20 minutes waiting for him to back track. Our cell phones were useless because there was no Bluetooth and he wouldn't have heard it ring. He did come back, but I was a tad frustrated. At this point I am adding the Sena to my farkle must have list. That darn list is getting longer and longer. Since you regularly ride with others it seems to be a natural fit. Since I have generally ridden on my own, the intercom function didn't seem to useful. Now with the sidecar, it's a different story. Richard, sounds like a slick solution but I might be a bit afraid that drilling even a small hole in the helmet might compromise its integrity. I bought a Midland blue tooth system - not to talk to anyone, but to listen to my GPS. 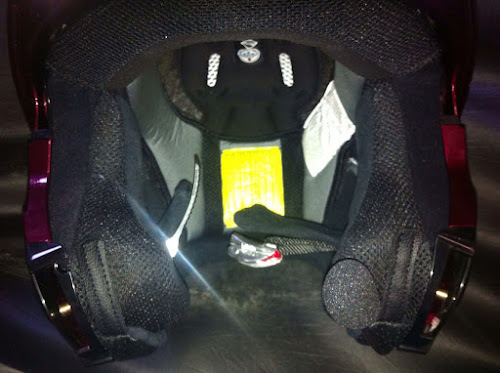 It mounted on the back of my HJC modular helmet, but battery would never last long enough to make it worthwhile and I returned to my wired ear bud. I'm waiting to hear from you and Bobskoot about how long the battery lasts with continuous use. I fretted over cutting the slot for a while but after I took out the liner, I could see that there is nothing structural in the thin plastic trim piece so I stopped worrying about it. The helmet shell actually ended about 1/4" above the trim and that is what the Sena clamps onto. I have no idea how long the battery is supposed to last. Richard, I've always had the microphone to one side on my SENA and Shoei combination because there's not enough space out front. It works perfectly and after 12 months, I'm still really impressed with it. Still haven't used the Bluetooth or MP3 functions as that's not my kind of motorcycling! I had picked the Sena based on the positive comments from a number of blogs including yours. I don't normally listen to anything while riding but it may have been nice on my last trip and now with the sidecar, a passenger is more probable. Nice fix on the Sena bracket. Good thing you are handy with power tools. Glad the helmet is quieter and you were able to get out for a ride and test it. Sure wish your temps would warm up, it's making me cold and it is a balmy 35˚F here this morning. I can't believe how quiet it is compared to my old helmet. And the whole BT thing is new. Bridget asked about an intercom system so there is now a great reason to get it working. Sena's recommendation is to use the stick on method. I like the clamp better. A quiet helmet is always a good thing... I tend to now only wear earplugs when doing a lot of highway time due to wind noise. As to pulling to the right at 50MPH, were you heading into a strong wind at the time? I rode the Suzuki rig today with Miles in the hack and it felt like it was pulling to the right until it hit about 40mph, then it went away...weird. Wish I could lean out the tug some more but I've hit limits on the adjustments. No winds at all. This is the first time I had the rig out on highways instead of crowned secondary roads. The airhead easily pulls the sidecar though 5th gear may be totally useless now. Is the pulling to the right indicative of another alignment problem? I.e. toe in wrong? Well, the ideal is neutral steering at speed....you mentioned crowned roads....that could be a factor. Try increasing your lean-out by another degree perhaps? Richard, thanks for pointing this post out to me. I really didn't want to resort to the glue method for what will be my new Nolan N104. I had read the same thing about trimming plastic for the Nolan N102, yet I managed to install the Sena SHM10 without altering the helmet. I'm now looking forward to getting my hands on the helmet so that I can tinker with the Sena installation. I also read your post on the firmware update. I never bothered to check, but my unit works flawlessly in all modes. I ain't gonna try fixing something that ain't broke.